My family’s visit has come to an end and the house is all quiet again. Things should be be back normal again but I’m finding myself somewhat lacking a little on the motivational front. Work has been really chaotic (we’ve all been given brand new laptops and telephones and system migration is taking place) and people are starting to leave so that’s probably one thing that’s distracting me. I’ve also been scheduled my first workshop sessions with the back-to-work specialists to help put me on the right job-hunting path, ie sorting out CV etc. So I managed a savings rate of 42%, which is better than last month. My average savings rate continues to drop – it’s now at 46.5%. This is still a pretty good number, but as I said in the last update, I don’t have many months left in the year to try to drag it up to my target of 50% so I will settle for getting as close as possible! This month’s income was boosted by £50 from rent received and £19.17 from TopCashback*. There was also an unexpected £500 referral fee, which came from a Manchester property developer – I’d put them in touch with my aunt, who had ended up making a purchase – boom! A nice little windfall and although tempting to just spend it, I’ve whacked it all into investments! I also chucked some more of my matched betting profits into some property crowdfunding via Property Moose. The markets continue to be pretty steady for my portfolio, (although there was a small wobble last week) which now stands at £82,888, a small gain of just 2% from last month. 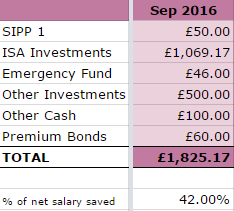 I received a nice sum of £83.29 in dividends, which compares favourably with last September’s £46.70. Total dividends received this year now stand at £638.09, so my target of £720 is pretty much in the bag – I think I should hit it next month, looking at dividends in the pipeline. Average dividend income so far is £70.90 per month, average over 12 months now at £53. 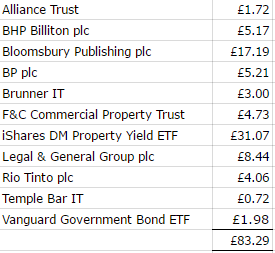 No new investments in shares or investment trusts this month – I just topped up a couple of my existing funds/ETFs. As per my post over the weekend, I sold three of my Monkey Stocks, so that money isn’t reflected in the portfolio as it’ll be invested next month. I also took the opportunity to sell the few South32 Ltd shares I owned, which were a spin-off from BHP Billiton plc. With the house back to myself, I should have taken the opportunity to throw myself into matched betting. However, as well as being a little distracted, I was having deep thoughts about my matched betting so instead, I ended up wasting time enjoying some binge-watching (‘Peaky Blinders‘ series 2 & 3, and ‘Stranger Things‘) and catching up on some reading. That’s not to say I didn’t do any matched betting at all – this month saw me earning £332 in profit, so a total of £2869 since I started matched betting seven months ago. It’s the lowest I’ve earned so far in a month but still, it’s good to get some extra cash. The matched betting service I subscribe to is OddsMonkey*. It’s a great website for beginners and seasoned matched bettors alike – for beginners, there are plenty of tutorials which provide you with step-by-step guides on how to make profits and to work through special offers. For the more experienced, the tools offered by OddsMonkey are fantastic, including the Each Way Matcher, Dutch Finder and Acca Matcher, all of which I use. Anyway, you can join for free to try it out. When she was over on her recent visit, my Mum decided that she wanted some new kitchen furniture – I chipped in towards it and ended up dipping into my emergency fund. It’s unlikely now that I will hit my target of £1k by the end of the year, but I’ll be topping the fund up with my redundancy money in any case. Still plugging away with the reading and currently on another finance-related book (again from the library), so will do a little review at some point. Hope everyone had a good September – roll on the winter months! This entry was posted in Blog Update, Cashback, Dividend Investing, Earnings, Expenses, Funds, Investment Trusts, matched betting, Portfolio, Savings, Shares by weenie. Bookmark the permalink. Ah – some time to enjoy the peace and quiet and put your feet up (or do some more matched betting!) – enjoy it while it lasts! Sorry to hear it didnt work out with the chap, but better to find out sooner rather than later, and just means the right person is still somewhere out there :). Best of luck for the job hunting and the future on that side, it sounds like at least the company is being supportive by providing some help, so hopefully something in the pipeline soon? 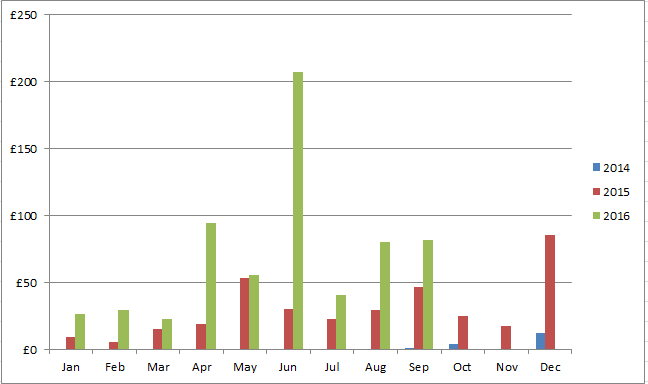 A very good month both in terms of savings rate (I accept its below what you are targeting but considering the UK average…!) and the dividends continue to roll in, along with a good variety in their source – hopefully a good buzz to see that in 1 year you have doubled your income? I’ve attended the first job workshop now and have already found it useful. My ‘mentor’ did advise against panicking and rushing into any old job so I’m remaining calm still! I’m very happy that my divis have doubled in a year, not that I will see that kind of increase next year but there should still be good increase. And yes, a good variety/mish mash in their source so hopefully diversified enough. A few hundred is better than nowt! 🙂 However, I slammed into a brick wall with the matched betting this weekend – ok, I wasn’t hungover, just a little tired and made a mistake, which ended up costing me a chunk of profits! Let’s hope I can recover over the next few weeks. Thanks for you support as ever. Your mentor is absolutely right – make sure you get the right role that works for you, and hopefully at the pay you want – if they are helping with the CV and interview techniques this should also really help when trying to find a new job – question is will you stay in the area or look wider? Always hard to make that move, and hopefully its not a question you will have to answer, but worth making sure you have an answer in the back of your mind! Keep going on the divis – you will be surprised how fast they keep adding up (I was when I look back over the last 4 years) and remember the snowball – each extra bit of income is adding to the amount your saving! I’m likely to stay in the area but Manchester’s a big place so there should be options for me! Ideally, I’d like to stay in the northwest. Yes, well, the matched betting errors (I made another one!) are entirely my own fault, just me being careless when I should know better. This month isn’t going to be a great one on that front but still, it’s better than nothing! It seems so weird that they are rolling out new hardware in the middle of a redundancy cycle. Who will be left to use it after you leave? I’ll be interested to hear your thoughts on the workshops, what the experience is like and whether you feel you get some value from the experience. Good luck in “keep on keeping on” through the chaos. Cheers Mrs ETT, am moving on and in fact, bagged a date already – I’ll be making sure it’s a frugal one haha! I know, really weird about the new hardware – nobody will be using our kit because we’re not getting replaced – I might enquire about buying the laptop and seeing what they say. As mentioned to London Rob, I’ve attended the first job workshop, which was about CVs which I found it really useful (my ‘current’ CV is over 8 years old!) The next workshop will be about sorting out my LinkedIn profile, interview techniques etc. Thanks and yes, I shall keep my head down and keep on keeping on! Congrats on the high savings rate! While it may not be the 50% you’re aiming for, getting, and staying, in the 40s is a great start towards building your early retirement case flows. Don’t stress over the man or the job. When it works, it works, and when it doesn’t, you’re better off finding something better! And you will find something better. Jack @ Enwealthen recently posted…Why Do Banks Charge What They Charge, Pay What They Pay, And Generally Act Like Banks? Thanks Jack and yes, whilst the savings rate isn’t 40%, it does make some different towards building up my future wealth. Trying not to stress on either bloke or job and don’t want to go on the rebound on either! You’re doing incredibly well with your savings rate and your dividend income! I remember a few months ago (maybe more like a year ago) that your dividend income was only a few quid – it’s incredible how much it’s grown in such a short period of time! As for the shows, I totally get why you binged on Stranger Things – it’s so good that binge-watching is the only way to watch it! Peaky Blinders is also incredible – I’ve only watched 2 episodes, but I can already tell I’m gonna love it..even though the accents are a little all over the place! Yes, it wasn’t that long ago when my dividends were just a few quid each month – I am very happy with the results of this year’s investments. Might not be such a huge increase next year but it should continue to go up. Haha, hear what you’re saying re the Peaky Blinders accents! I can’t wait for the next series of Stranger Things! Sorry to hear about the bump in the road for your love life, glad to hear you’ve kept a positive attitude as usual and got straight back on the dating scene! Cheers TFS, although need to be careful about rebounding! It’s always great when you receive money unexpectedly and I am sure your future self will thank you that you invested the £500 that came your way. Great to see the dividends building up and it’s almost double the amount of last years so congrats with that! Rooting for you to hit your annual target. Fingers crossed! Yes, whilst it was tempting to spend that windfall, it was just more ‘sensible’ to invest it! Looking at the dividends that have come in this month, I think I have that annual target in the bag already, which I’m very happy about!